Psychometry (Reading emotional imprints from objects), Flow-walking (combined with Psychometry) and a Heightened form of Sense allowing him to counter Force Cloaking where a Jedi shrouds his presence within the Force. A Jedi who takes an interest in most aspects of the Force, Jared has learned a wide array of Force techniques even using some to boost his otherwise poor lightsaber skills. A long term sufferer of Insomnia, Jared gets little sleep so will often be seen meditating with menial tasks such as cooking. This free time has allowed him to learn many non-essential skills and honed his investigational powers. Conversely he will occasionally force himself into a deep healing trance every few months to remain sane. Jared Quell’s earliest memories are not of his home world of Kiffu. Instead, due to memory loss, he remembers virtually nothing prior to his arrival at the academy on Yavin IV. His only possession was a lightsaber master Keigoku described as ‘casual, with distinctive markings’. In time, Jared began to read in the archives and would keenly watch padawans learning from their masters. He began to hope that one day he may learn from them and become a Jedi. After a year of living in the temple and being taught meditation Jared became aware of his psychometric abilities, he was able to see his father’s image when clutching the lightsaber in meditation. His father had been a Jedi. With this, Jared resolved to learn all he could and in time (on 234.21) he was initiated into the order by Master Phoe Nhix. Years passed as Jared attended the lessons given by the masters, he enjoyed the history lectures with master Alkorda most of all, but he always felt something was holding him back. By the time he was 16, Jared had resolved to find out what had happened to his father, and after some time tracked down his father’s old mentor Kurlinte Vel. Jared left the temple, now based at Bespin, and journeyed to Kiffu to learn all he could from the old Kiffar. Jared spent over two years on his home world and learnt very little about the events surrounding his father’s disappearance and death. All that was known was that he had been on Kiffar business working undercover on behalf of the Guardians. His lightsaber had been entrusted to Jared on the understanding that in his stead, Jared would be sent to the academy for training, what really happened will probably remain a mystery forever. Jared learnt a lot on Kiffu and absorbed as much of his culture as he could. He travelled with Kurlinte all over the planet from its harsh desserts, to its lush and hidden jungles learning many of the shamanistic rituals Kurlinte practised, assimilating this into his own understanding of the nature of the force. After some months, Jared settled down outside the village of his father’s birth. There he met, and later fell in love with, Q’ara Terente. She was a local farm hand, and each morning would bring Jared and Kurlinte soda bread and milk. Cycles became months, and this idyllic life seemed like it would last forever. One day, however, Q’ara became sick. Her Illness defied the understanding Kurlinte, Jared, or even the city Doctors. Understanding the condition was terminal, Jared became ‘honour bound’ with her (Kiffar have no concept of Marriage in a legal sense, but form significant bonds with each other, one such bond would be having a child with someone) and with his limited knowledge of the Force, made the last few months of her life pain free. She died one morning, as the light from Azurbani stretched out across the village, at peace and with the Great Spirit. It took Jared many Cycles to decide what to do next, but eventually he made the decision to seek out his old friends at the Jedi temple and restart his training. He believed he had experienced enough happiness for one lifetime, and now he must protect the happiness of others. And so the Force guided him once more. Within months he was granted the status of a Padawan learner, throwing himself into his studies. It was obvious that many of his friends had surpassed him since he had left, but Jared resolved to make up for lost time and continued to train and study. One day, after following Masters Soh and Phoe to Yavin IV he was placed under the guidance of Gabe Alkorda, along with his friend and fellow padawan Sarrecm’ar’reccarve. Under Gabe’s tutelage Jared grew both mentally, and spiritually. He and Marr became like brothers, while Gabe began to teach him advanced techniques such as ‘Flow walking’ which Jared would later learn to combine with his growing Psychometric abilities. 4 Years passed and Jared finally came to terms with the loss of Q’ara. He would venture off Bespin, and later Yavin IV whenever time would allow him, and when it did not, he would study hard and meditate often. His skills with a saber became competent, if not dazzling, but his understanding of the Force seemed to grow with each coming Cycle. On one occasion Gabe took Jared back to Yavin IV to train. Here, Jared perfected his ‘Force Radar’ technique, allowing him to pinpoint Master Alkorda even when he ‘Cloaked’ himself using the Force. Eventually the order moved back to Yavin IV after Bespin withdrew temple funding. On his final mission as a Padawan, Jared volunteered to extract a group of Aquar slaves from a mining facility on Velusia. Once again though, circumstances seemed to work against him and every sentient in the facility died. His resolve was shaken, but after some words with Rash Loist and Master Alkorda, Jared looked inward and found he had already accepted loss. Death, is a part of Life, and in trying his best on that mission, he had not failed, despite the tragic outcome. This was the toughest lesson Jared had to learn as a padawan, and as a padawan, it would be his last. On 245.17, Jared was knighted. He was also presented with his father’s lightsaber (destroyed by Gabe during an intense training session where Jared had to hide his emotions) now restored. Over the next few years Jared began to pass on his understanding of the Force and life to the younglings in the temple on Yavin IV. He would teach Meditation to those that needed assistance, and now granted access to more areas of the Archives, would often fill his evenings with reading that vast database. One student intrigued him, the Falleen girl Syrena Exan. With a shared interest in Flora and Fauna, the two would often chat in the long afternoons and over time Jared knew that the Force was calling on him to train her as his first Padawan. His request to the High Council was granted and on 246.16 Syrena became his apprentice. The next four years saw much unrest in the Galaxy with the formation of the Commonwealth. The conflict took its tole on many Jedi in different ways, none so hard as Jaredâ€™s former master Gabe Alkorda who assassinated the Chief of State Feksk and resigned from the order to go into hiding in the furthest reaches of space. Meanwhile Jared remained in the temple devoting his time to the contemplation of the Force and teaching Diplomacy and then Force Theory and Mastery to many of the students. All the time he kept a firm hand with Syrena and in the year 250 she was finally strong enough in the Force to construct her first lightsaber. Jared took Syrena to Ilum. There she faced many psychological ordeals manifested by the spirit of a Dark Jedi kept in the crypts of the ancient temple to test aspiring young Jedi. She faced her fears and was rewarded with a copper coloured crystal. A short time later on 250.26, Jared was called by the Council to join them as a member of the Voice Council. A position he humbly accepted, seeing it as the natural path for him and the best way to continue assisting the students of Yavin IV. He continued to train Syrena, going on numerous missions with her (with the exception of a mission to Bancoon he made solo) until 254.11 when the duo were sent to Ord Cestus to investigate a Mine. Syrena encountered a Dark Jedi who had obtained an archaic force relic,and after rescuing the surviving miners from the imminent collapse of the structure, the two Jedi were able to pursue him into space. An intense dogfight ensued with the Jedi facing not just Ventfort, but an entire destroyer class star ship. Syrena destroyed the Dark Jedi’s shuttle and together she and Jared disabled the destroyer. After a debriefing from the High Council the unspoken decision that Syrena had passed her final trials was made and right there she was Knighted. Jared then spent some time investigating the Ord Cestus incident, journeying to Ossus to obtain more information on Ventfort and rumours of an exploration vessel that vanished in the unknown regions of space. On 254.28 Jared took Arikakon Genkal as his second padawan learner. Genkal was a Mon Calamari and had worked with Jared in the past, resolving the crisis on Dac with the Quarren people, additionally Arikakon’s training had been overseen by Wesley Ryor and Sarrecm’arr’ecarve but neither Jedi had been able to complete it. 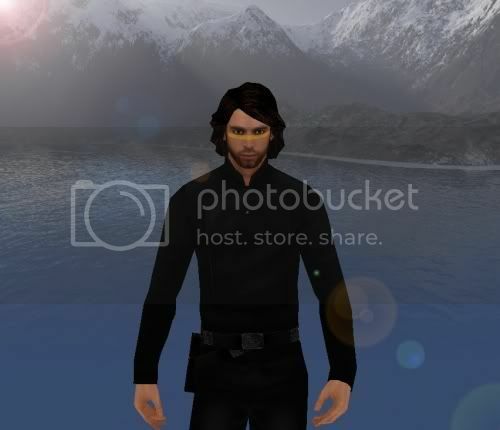 Determined to hone Arikakon into a fine Jedi Knight, Jared set out an intense training regime focusing on Arik’s Force abilities, reasoning, meditation and mediation. At the start of 260 the order returned to Yavin IV. At this time Jared was heavily involved with an investigation on Anzat that would eventually lead him to foil several Assassination attempts on high profile Senators. It was apparent that a dark force was rising in the galaxy, but with the bitter also comes the sweet, and on 261.14 his friend Aayla Vigil was Knighted and on 261.17 Jared was acknowledged as a Jedi Master. Shortly after this, Jared and Aayla journeyed to Ryloth. Jared had contacted Aayla’s mother and had arranged the meeting in the hopes that Aayla, now a Knight, could get some closure and understand the events which had troubled her so much as a hopeful. The happiness of the trip was short lived though, as they pair encountered a terrorist group and discovered that Aayla’s stepfather had been wrongly imprisoned. It became apparent that both elements were part of a plot to lure the Jedi to Ryloth as they encountered a Dark Jedi in the caves near the bright lands. In a few sickening minutes, Aayla’s prophetic dreams from her youth were fulfilled, but the Jedi were prepared. While Aayla was severely injured the Dark Jedi was defeated (his body then disposed of in the bright lands) and the trauma of the encounter forged a deep Force bond between Aayla and Jared. In the following days the two old friends finally accepted the truth of their feelings for one another and reasoned to inform the Council before continuing. Any deep emotional or physical attachment is always a concern for a Jedi but the Council recognised Jared’s commitment to the order and Council ruling, and with a watchful eye on the pair, condoned the relationship. A great weight felt like it had been lifted and Jared was able to refocus on the emerging threat in the Galaxy. By 266.16, after a prolonged investigation, Jared had formulated a plan to neutralise the Sith Lord Darth Rishi. Together with the rest of the Strike Team sent by the Council, he participated in attacking Rishi’s flagship and fighting within the vessel to confront the Dark Lord and strip him of his powers. The mission did not go entirely without hitch however and Jared was Killed after preventing an explosive device from destroying a level of the command deck, the feat having drained him of energy completely. He would get a second chance however, as Master Nhix managed to resurrect him having defeated Rishi with the others. En route back to Yavin IV, Master Nhix announced his retirement after the successful mission against Rishi. He also informed Jared he had been promoted to the High Council. Jared completed the training of Aslyn Denethorn, subsequently took on the training of Indilia Von but towards the end of 269 ABY he felt the Force call him away from Yavin IV to train another and on 270.12 he officially retired from the High Council and left Yavin IV. For two years Jared remained isolated from the order, training the Zeltron formerly known as ‘Darth In’Dago’. His efforts proved fruitful. Anetta (the girls real name) blossomed over the long months and gradually found the light. With Anetta’s training all but over, Jared returned to Yavin IV where much had changed. Later, during the conflict between the Alliance, the Mandalorians and the Chiss Ascendency Jared wandered the galaxy serving the Force’s will. It was during this time Jared noticed the profound side-effect of Master Nhix’s resurrection technique. He was now ageing at a greatly reduced rate, and as the years passed his trips back to the temple and it’s new site on Alzoc III would become bitter-sweet. Pride filled him when he saw generation after generation of student graduating, but always mired by the sense of sadness in watching his friends grow older while he felt at a standstill. Already a Jedi Master and ex-councillor, Jared’s experience became an invaluable asset on missions the Council deemed too treacherous for younger Knights and for many years, time was spent out on the fringes of the galaxy or deep in the dangerous galactic core, nearly always undercover or unassisted. At last, loathed to lose all connection to the branch of the Order that had been his home for decades, Jared requested to become the Sector Watchman of Alzoc and soon his visits to the order became more frequent. Eventually, well into his Sixties, Jared was given another padawan, a survivor of the Ossus attack named Herenai Galadan. In doing so, the Jedi Master was able to re-establish his link to the on-going life in the Enclave and maintain a more stable presence for his old friends and former students alike. Shortly before reaching his seventieth year, Jared took on an additional padawan learner, Nastajja Arren. The Ryn already had some training under her belt from her previous mentor Nira’kalen’nuruodo and quickly flourished under Jared’s tutelage. His features and appearance still belied his true age, but Jared’s hair had at least begun to grey even if the pace of his own training and investigations for the council didn’t let up.